Note: You can enter this giveaway two (2) times per e-mail address per day. Deadline is 11:59PM ET 4.16.19. Do you believe in magic? 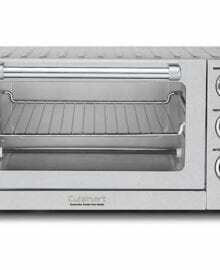 You will once you see the Cuisinart Convection Toaster Oven Broiler. It does much more than make toast, not that there’s anything wrong with cheesy Parmesan Toast. This beauty bakes cakes and potatoes, and is large enough to make a 12-inch pizza, and will toast up to six slices of bread at once. The convection fan cooks food faster and more evenly and the oven is equipped with a keep warm function in case you’re multi-tasking. A broiling pan and baking/drip tray is included so let your cooking imagination run wild. NO PURCHASE NECESSARY TO ENTER OR WIN. Void where prohibited by law. Open to legal residents of the 50 U.S., D.C. and Canada (excluding Quebec) who are at least eighteen years old at the time of entry and have internet access. Begins on 2.19.19 at 12:00:00 a.m. ET and ends on 4.16.19 at 11:59:59 p.m. ET. To enter the giveaway, submit your full name and email address on this form. Odds of winning this giveaway depend on the total number of eligible entries received. Only two (2) entries per email address per day. Sponsored by Leite’s Culinaria, Inc. For more information, visit our Official Rules. Be sure to add giveaways@leitesculinaria.com to ensure notification if you are the winner.